Ants are 'better than humans' when it comes to choosing a new home, according to researchers at Bristol University. 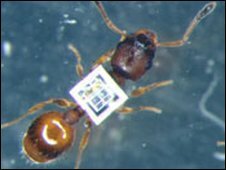 Radio-frequency identification tags measuring up to 3mm in length were attached to the backs of rock ants and then monitored by scientists. The ants were allowed to choose between two nests, one of which was superior to the other in its construction. They noted the ants chose the superior nest even though it was nine times further away than the alternative. Dr Elva Robinson of the School of Biological Sciences said the study showed that ants are better at house-hunting than humans. "Ants finding the poor nest were likely to switch and find the good nest, whereas ants finding the good nest were more likely to stay committed to that nest," she said. "When ants switched quickly between the two nests, colonies ended up in the good nest." "On the other hand, animals - including humans - who use comparative evaluation frequently make 'irrational' decisions," said the professor. The scientists found that when a colony of rock ants needed to emigrate to a new nest, scouting ants first discovered new ones and assessed them before leading nest-mates to the new nest to prepare it before the rest of the colony emigrates. During the study 41% of the ants that visited the nearer, poorer nest later switched to the nest which was further away. Only 3% of the ants that first visited the far nest switched to the near nest.